I am a Midwesterner by birth, but have lived in seven different cities. My wife, Kelly, and I moved to Atlanta—where she grew up and went to school (UGA)—after our first daughter started to run and our 14-foot-wide row house on Capital Hill started to feel very small! I have two degrees in philosophy, worked in publishing in New York City, then became a principal at Gensler, the world’s largest architecture and interior design firm. I briefly worked for Shaw Industries as a director of marketing for Shaw Hospitality and Shaw Contract before starting Innovatude in 2014. 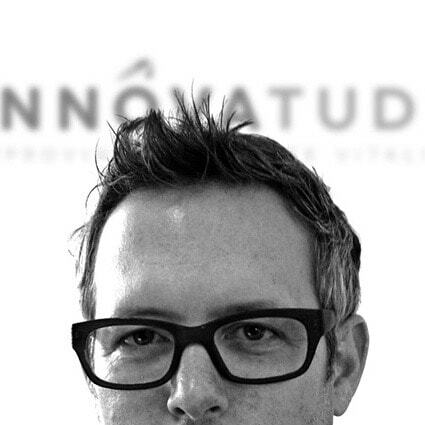 Innovatude is a boutique marketing and brand consulting and design agency that practices Outside-In Marketing. This means we start by understanding our clients’ customers and help our clients develop products, services, marketing that meet those needs. Outside-In gives us the ability to create innovative solutions that an audience is looking for. The other unique element of how we work is that one of our partners is the point of contact for every client relationship we have; we believe in developing the next generation but don’t believe in delegating client relationships. Most of our work is with companies who target architects and designers. And because of our backgrounds, one of the services we provide that is most in demand is helping those companies see what’s next. If we can forecast what’s next and the trends that affect the people who literally design our world, we can help our clients capitalize on change. To find out more, connect on Instagram, Twitter, LinkedIn, and Facebook. 1. Tell us about how you came up with the name Innovatude. The story starts with a cease-and-desist letter from someone whose name was close to the company’s first name. While my lawyer advised I could win the case, the fees he quoted me inspired me to find a new name. Late one night in the studio we came up with Innovatude. Innovatude is the combination of innovation and attitude. It expresses two core elements of the company’s point of view: We bring an attitude of innovation to all client engagements. 2. What is a notable highlight for you (personally or professionally) within the last 6 months? We recently repositioned a 33-year-old, family-owned commercial glass manufacturing company, McGrory Glass. We defined the brand’s personality, tone of voice and promise, then found positioning that gave them Blue Ocean in the marketplace. We refreshed their logo, overhauled their website and completed two cornerstone pieces of print collateral. They’ve been such an amazing client, valuing our opinion yet pushing us to do our best work. The partnership and the product we’ve produced make this the highlight for me. Plus, we got to work with three of the six McGrorys who work in the company! 3. How has being a part of the Roam community impacted you and/or your business? We’re a virtual agency, so Roam gives us a central meeting spot for our creative team. We meet, collaborate, experiment and then can also go concentrate and get our heads-down work done, too. I love the sense of community I get at Roam; being a member of Roam has given me the camaraderie that I miss from working in a corporate setting. 4. Share a fun fact that most people might not know about you. Three days before we got married, I learned my job was moving from DC to New York. Six months later, we packed up our office and our apartment and moved. We spent our six month anniversary walking across the Brooklyn Bridge. Although we only lived there for two years, we love to visit. For our 10th anniversary we returned to our favorite restaurant in Brooklyn, and this past December we were able to share the place with our two daughters. 5. What was the best part of your summer? For the past eight or 10 years, our family has observed a holiday that our girls came up with. Toward the end of July, we celebrate Daughters’ Day. This year, we spent Daughters’ Day on the Beltline searching for Atlanta’s Tiny Doors, exploring Little Five Points, enjoying Skyline Park at Ponce City Market (wouldn’t that be a smart place for a Roam!?!) and stopping in the Old Fourth Ward, Grant Park and Kirkwood. It was an intown adventure and a day spent creating lasting family memories.